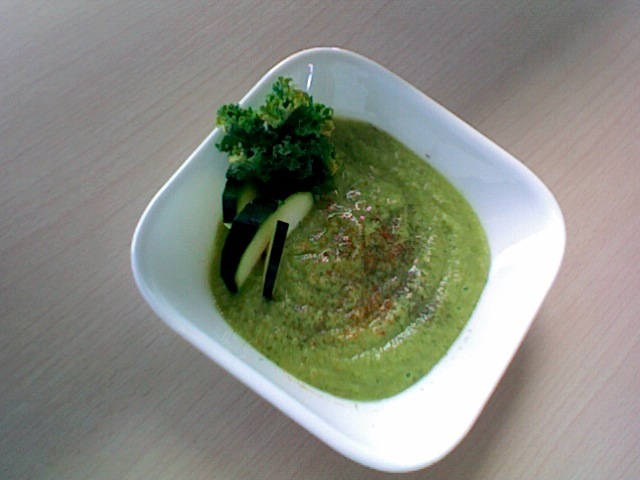 cleansing and clarifying: Cream of Zucchini. This soup is DELICIOUS. None of the spices overpower one another if measured properly, and you can taste everything all at once, if you make an effort to explore your taste buds. Very impressed, and definitely going to make this simple little thing over and over again, even after the detox. I topped it with some collard greens to make it fancy, as well as a couple of slices of zucchini, some extra dill, and cayenne pepper too. I'm loving this. The consistency isn't too thin, nor is it to thick. It's very liquidy, but not watery. Well done, Andrew.